It’s no news that waste management has grown complex. What was once relatively simple has become separate streams for recycling, organics, hazardous material, industrial waste, and good old garbage, each with its own unique pricing structure. As this core service has become more complicated, so too has the receivables processes associated with remittance from customers. A well understood routine of invoice and check is becoming ever-more disrupted by new options in payment methods and payment channels. Further complicating matters, many companies haven’t kept their payments software up to date — or as in most cases, never consolidated to a single receivables platform. So they have different tools doing all of these things, or worse yet, it’s all still done by hand. It all makes for an alarming hodge-podge of manual processes and disparate, siloed systems. But the tide, it is a changing. According to the Aite Group, 81% of receivables and treasury executives in the U.S. perceive adopting an integrated receivables hub as adding value to their organization. Furthermore, 60% of receivables and treasury managers are not satisfied with their current remittance processing systems. Learn how Parks & Sons of Sun City, Inc. reduced payment processing time by 80% using the ETran Integrated Receivables platform. Checks have stood in good stead, making it convenient for people to make payments wherever they are. And while check use overall is in decline, checks still accounted for over 50% of B2B remittances in 2013, according to the 2013 AFP Electronic Payments Survey. And that’s just the B2B market. Direct consumer payments are a large sources of added check volume. Needless to say, we’ll be using checks for a decade or more to come. Checks are a vital key to the whole thing. Waste services organizations, whether they’re small businesses or national enterprises, need to ramp up for the inevitable online and mobile advances that are making waves in the payments industry. They need a solution that can process checks and remittance documents more efficiently, saving time, improving cash flow, and reducing costs, while helping integrate multiple payment platforms into one easily managed, low-cost solution. Who should read this eBook? In this free eBook, you will learn five steps to make integrated receivables and straight through processing a reality for your AR organization. 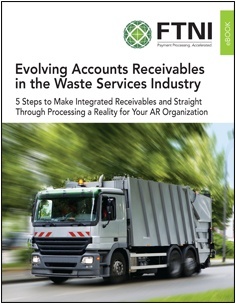 This eBook is designed for waste services businesses that want to save time and money by streamlining accounts receivable processes, eliminating wasted manual effort, mitigating risk and, best of all, decreasing the time it takes to get your money into the bank.